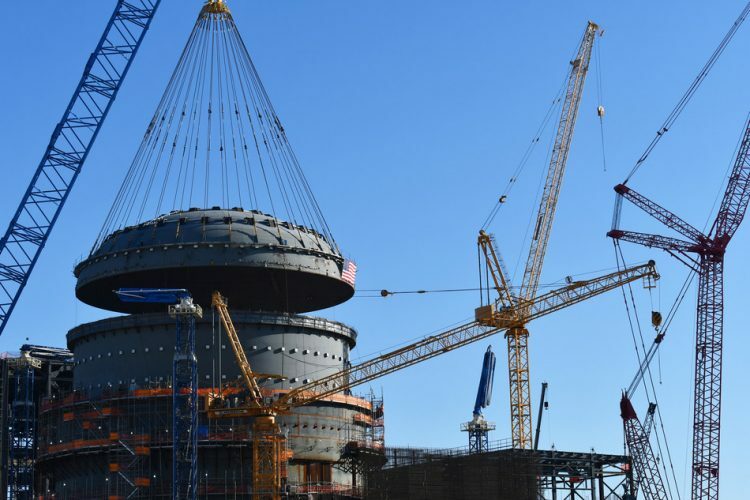 / Energy / Bechtel Completes Major Milestone at the Only Nuclear Plant Under Construction in U.S.
A Bechtel-led team today placed the massive dome on a new nuclear reactor building at Plant Vogtle Units 3 and 4 in Georgia, the site of the only nuclear power facilities currently under construction in the U.S. When complete, Plant Vogtle will be the nation’s largest generator of carbon-free electricity. Weighing approximately 745 tons and measuring 130 feet in diameter, the dome, known as the “top head,” is the roof of the high-integrity steel structure that contains Unit 3’s nuclear reactor. The dome was lifted into place by a giant crane. The setting was completed by 9:45 a.m., following a complex rigging operation that lasted 90 minutes. The milestone drew the attendance of several dignitaries and executives, including U.S. Secretary of Energy Rick Perry; U.S. Secretary of Agriculture Sonny Perdue; Governor of Georgia Brian Kemp; President of North America’s Building Trades Unions Sean McGarvey; Southern Company Chairman, President and CEO Tom Fanning; and, representing Plant Vogtle owners, Georgia Power Chairman, President and CEO Paul Bowers. The placement follows the completed installation of Unit 3’s nuclear steam supply system — the reactors, reactor coolant pumps, steam generators, pressurizer and associated piping. These are the essential elements of the unit’s nuclear power system, used to generate the steam needed to drive the unit’s turbine generator to produce electricity. Unit 4 marked a milestone of its own in January, with the placement of the 225,000-pound pressurizer inside Unit 4’s reactor building. The pressurizer will provide pressure control inside the reactor coolant system during unit operation.